Industrial projects: £0.5 million – £20 million. Completed working drawings for the refurbishment of a distribution centre into aircraft wing component factory, this included the design of canteen and welfare facilities. Worked on smaller projects independently with exposure to client & consultants. Retail projects: £5 million – £20 million. Produced production information on the cladding systems, mezzanine and offices on an out of town retail outlet as part of a very small team. This included answering queries and resolving technical issues. Worked on the planning and production drawings of a replacement multi-storey car park for a large out of town shopping centre. This included producing drawings and visualizations to illustrate how each retail outlet will be effected in each phase of the rebuild. I had many site visits and meetings with the contractor and gained working knowledge of demolition method statements and other complex issues associated with maintaining a fully functioning shopping centre. 18 months duration ; RIBA stages C-H.
Competition: law courts, Port Talbot. Amended Revit model to clients comments and produced visualizations from a Revit perspective using Photoshop in very short space of time. Commercial projects: £0.5 million – £30 million. 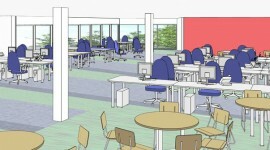 Produced drawings for planning & construction on new build and refurbishment office buildings. Also completed defects inspection reports, feasibility studies & visualizations. Master plan: Wheddon Cross, Somerset. Worked on feasibility studies as part of a team, which included an in house competition of a visitors centre.